In this work, the modal parameters of a reduced scale, thin-walled, metallic rocket nozzle are extracted through Operational Modal Analysis (OMA). The specimen is excited using pressurized gas from a rocket nozzle test stand. Deformation of the nozzle lip is measured using a non-contact optical technique consisting of two-dimensional marker tracking in conjunction with phase-based motion amplification. OMA methods that use digital image data suffer from low signal to noise ratios (SNR), especially in higher modes with small amplitude vibrations. The structural displacements are often on a subpixel scale and therefore difficult to analyze without additional image processing. Phase-based motion amplification (PMA) offers a possible solution to this problem by magnifying subpixel motion. This work focuses on the implementation of the technique in a marker-tracking algorithm, which serves to extract the time-history of high-contrast markers placed on a large area ratio nozzle with a 5.3 inch exit diameter. Grayscale images taken with a high-speed camera are first processed with the phase-based algorithm to increase the marker motion in a certain broad frequency band. This results in a set of modified images, which are then analyzed with a tracking algorithm that identifies centroid positions of fluorescent markers. The time-history of these markers is then used as input for an OMA algorithm, namely the Complexity Pursuit algorithm, which leads to estimates of eigenfrequencies, damping ratios and mode shapes. A quantitative comparison between the modal parameters obtained with and without additional motion magnification is provided. Results of a numerical simulation are provided that demonstrate the improvement of estimated modal parameters. The modal parameters of the first six modes of the nozzle are found using this method. The motion was amplified in the range of 0–1400 Hz which includes the six eigenfrequencies. Without application of the broad band PMA, the highest mode cannot clearly be identified and the quality of the other modes decreases. 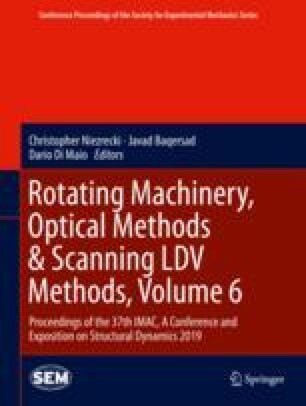 The authors would like to thank Mr. John Valdez of the Applied Research Laboratories of The University of Texas at Austin for assisting with the experimental measurements.